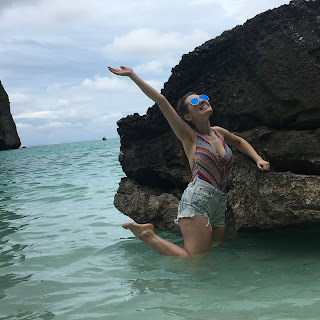 When I was planning our trip to Phuket I knew I wanted to do the typical tourist stuff: Phi Phi Islands, Phang Nga Bay etc., But I also wanted to do something a little bit different, something that I hadn’t seen come up often in Phuket Vlogs. Plus, coming from England to Thailand, I wanted to see some jungle! So, I started my research: tours, blog posts, vlogs etc., but I wasn’t finding what I wanted. Then out of the blue I thought ‘hey! 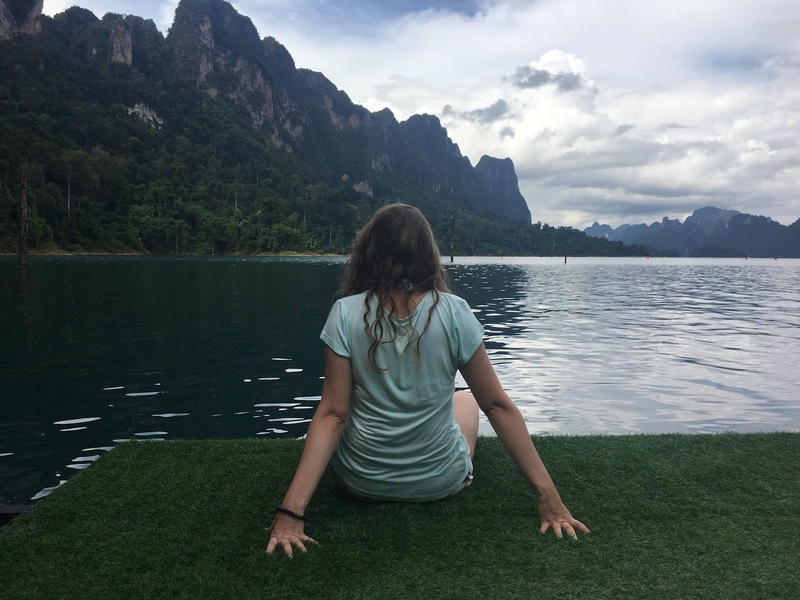 What about a national park to get my jungle fix?’— That’s when I found Khao Sok and boy oh boy did it look incredible! It was everything I had dreamed of and more! I thought it’d all be easy from then on out, that was until I started looking into tours. I couldn’t find a day trip ANYWHERE! There was plenty of two-day tours and tons of three-day+ tours but one-day tours— nope, nothing, zilch! But just as the disappointment and irritation was kicking in, I stumbled upon this tour! Thank the stars! 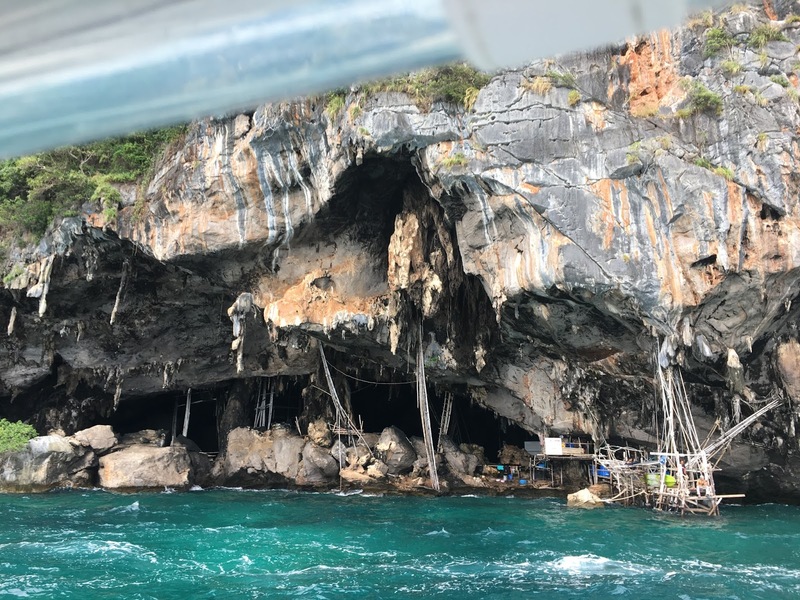 At this point, I had already booked our Phi Phi Islands tour with Simba Sea Trips so I had already done all of my research on the company. The tour itself hadn’t even started running when I stumbled across it (the day that we did it, it had only been in action for a handful of days) so we were a bit hesitant to book it but after lots of umming and ahhing we decided to take a gamble. Spoiler alert, I’m very glad that we did. 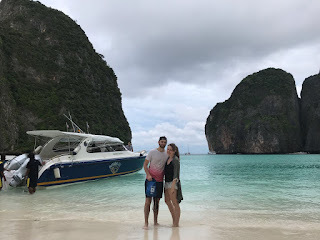 We got picked up from our hotel at 5:40am then headed off to pick up the rest of the group and our tour guide, M (who was also our tour guide for the Phi Phi Islands tour a few days prior). He was a fantastic tour guide and just an all round brilliant person. We spent a good couple of hours in the mini bus, and having M there to give us an insight into everything that we saw along the way (from animals, to people and their jobs and even down to the plants and trees that we saw) made the trip a lot more knowledgeable ad entertaining. 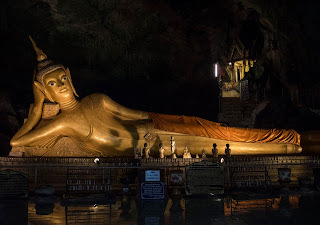 Our first stop was to Wat Suwan Kuha (Cave Temple). When I stepped out from the mini bus, it was like I had arrived in heaven— there were dogs everywhere. I was surrounding by scrappy and scooby doos and I’m not going to lie, that was my favourite part of this stop. What can I say? I love dogs. Anyway, dog talk over, Wat Suwan Kuha is a natural limestone cave that was turned into a place of worship by humans. 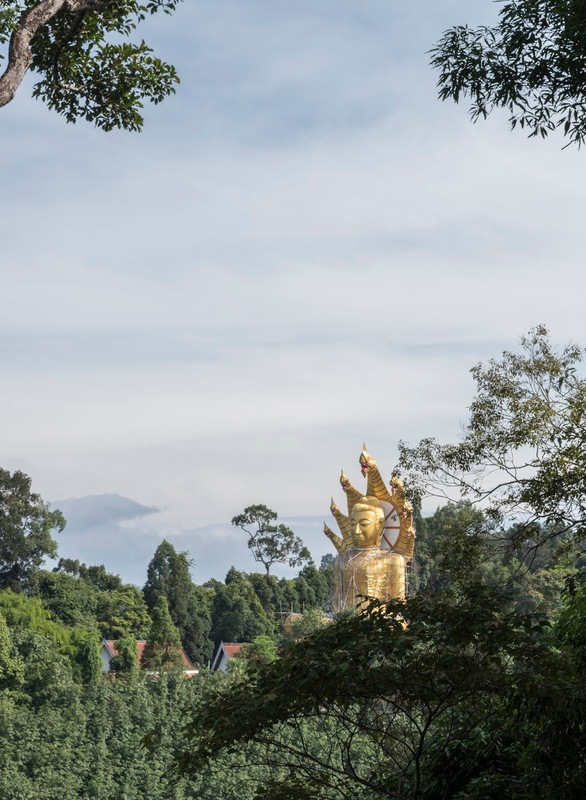 Inside you’ll find the impressive reclining golden buddha, as well as other shrines and images. Past the reclining buddha, there are steps that take you into another part of the cave which has a stunning open view of the surrounding forest. Me and Alex were last to leave, as always, and join the rest of the group for a pre-breakfast snack. I can’t remember for the life of me what it is that we had. I didn’t really eat much as the dogs from earlier had made a reappearance which meant that I got slightly distracted. Once everyone had finished eating and we had to given what was left to the pups, we headed off to our next stop. The next stop was the incredible Wat Bang Riang. Like the same for every stop, we were there well before the bus loads of tourists came pouring in. When I got out of the mini bus, my jaw dropped to the ground. No number of pictures could show just how surreal this place was. Boy, I don’t even know where to start. 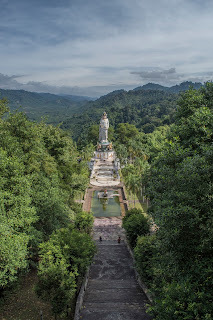 The surrounding jungle, the peaceful silence, the temple and the large statues of Kuan Yin and Phra Nak Prok. It was everything I had ever dreamed of for my first trip to Thailand. And guess what, we were greeted my two dogs as we arrived- even better! We had about 20/30 minutes to have a look around the grounds and inside the temple itself. I wish we had a little bit longer as I was hoping to go down the staircase that lead down to where the Kuan Yin statue was. 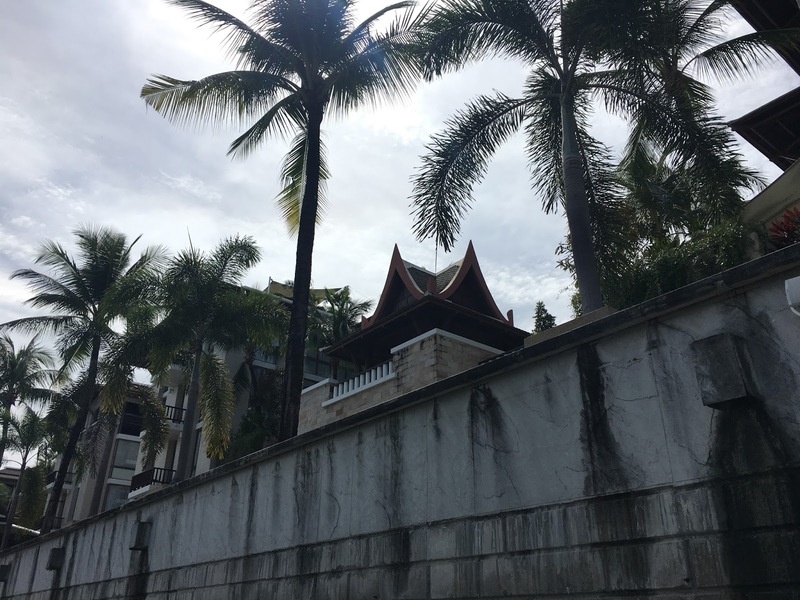 The temple, and the grounds even, were beautiful. My favourite part about this stop was how tranquil it was- I could’ve laid down to take a nap. 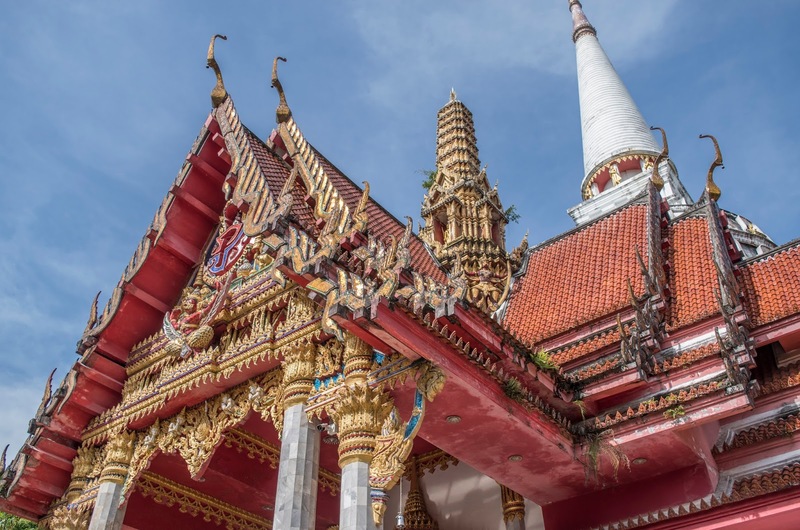 Unlike at the last stop, you have to dress respectfully to get into the temple but I believe you can rent clothes if you’re dressed inappropriately. After we had a look around we sat down to eat some breakfast. Which was delicious I might add. We had sticky rice and chicken legs, there was a vegetarian option as well but I didn’t see what that was. Once we had finished and gave what we didn’t to the pups, we took one last look at the view then headed off at Cheow Lan Lake. After a long car ride, we arrived to Cheow Lan Lake. When you arrive there, you go through a small building with a couple of shops and a toilet. A quick side not: if you can help it, don’t use the toilets! Try to hold on until you get to the restaurant, just trust me on that one. We went down to our longtail boat, then we headed off to explore the lake and go to the floating restaurant for lunch. For once, I won’t go into too much detail about the lake because I could be here for hours, but there are no words to describe how epic and beautiful this place is. Just book this tour and see it for yourself! We stopped at one point because M wanted us to get pictures by these three rock formations (I feel like they had a specific name or a nickname at least, but I can’t for the life of me remember what it was). It was so nice to stop and just float so we could fully take in the beauty of where we were. After a fairly long but breathtaking boat ride, we arrived at the restaurant. We put down our bags and had 20 minutes to relax and take in the view. Me and Alex decided to go swimming in the lake because, well, how could we not? I just… I mean… ah, I can’t describe how surreal this was. 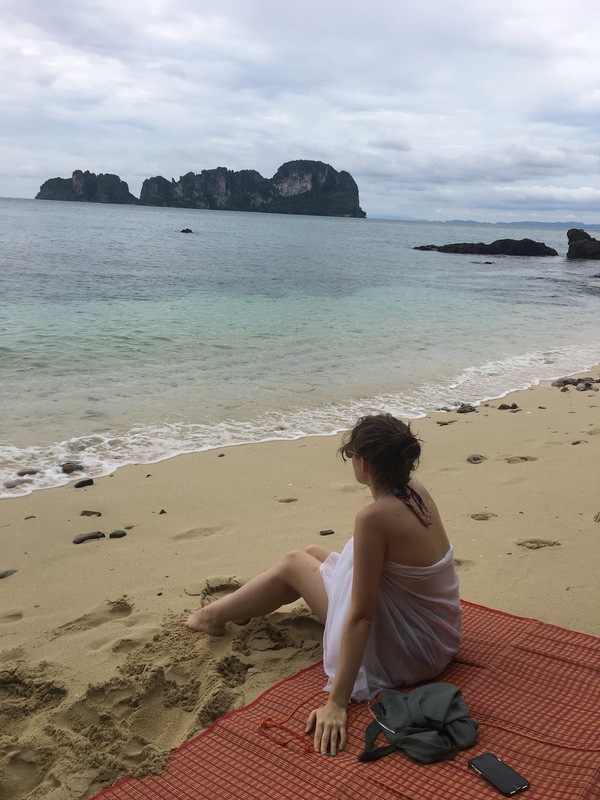 Everything was so quiet and the view- oh my gosh, the view was just incredible. It was one of them moments where you just sigh and smile because you can’t believe what you’re seeing with your own eyes. All I could think of was ‘I know the planet we live on was beautiful but I never knew it could be this beautiful, damn!’. After one of the best experiences of my life, we went upstairs to have lunch with one of the most amazing views. If you haven’t already been able to tell, this place was incredible. The lunch we had was really nice and there was so much that it was close to impossible for 7 of us to eat it all! Plus, I spent most of my time taking a thousand pictures that all turned out to look pretty much identical, because I just couldn’t believe what I was looking at. Unfortunately, an hour after arriving, we were leaving. As we pulled away, I couldn’t take my eyes off of where we were. I wanted to make the most of it until it was completely out of my sight! The view remained to be pretty spectacular on the way back. The journey back zoomed by and before I knew it, we were back in the mini bus on our way to the last stop. The final stop was Bamboo Rafting. Which, strangely enough, they’ve taken off of this tour now so I guess there’s no point going into too much detail about it. It was a pretty cool experience though. I was waiting to see Mowgli laying on Baloo’s belly as they floated down the river singing bare necessities. Obviously, that didn’t happen, but I really felt like I was in the middle of the jungle- it was an incredible experience and one that I won’t be forgetting anytime soon. Mainly down to the bug bites that I still have on my ankles. Another thing, make sure you bring bug spray because we did, yet we still got bitten quite a bit. 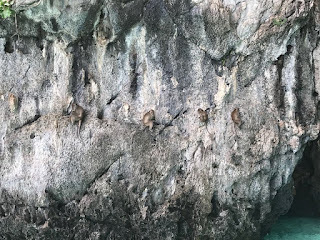 One thing that I do want to mention, even though this last stop has been taken off of the tour, is that when we got back to where the mini bus was parked and where the toilets and refreshments were, this was a little monkey; we all got excited because, well, it’s a monkey! Then, when I came out of the toilet and we got onto the mini bus, I noticed that he had been chained up to a post and the chain wasn’t long at all. It broke my heart as we drove away, I wish I could’ve done something rather than just crying for the first hour of the journey back. Animal Rights is something I am very passionate about but let’s save that for another post as this one is long enough already. I did, however, see an elephant free in the wild on the way back; so that temporarily put a smile on my face. If you have any questions feel free to ask me and I hope that wherever life takes you next, it’s somewhere the makes you smile. 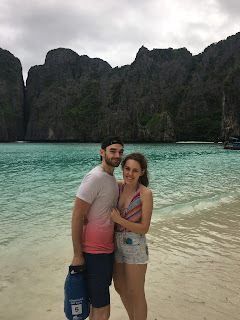 There was no way I was going to go to Phuket and not do a Phi Phi Island tour. Call it a tourist trap if you must, but it’s always been one of the top things on my bucket list; So really, I had no choice than to tick it off and I’m bloody glad that I did. We did our tour with Simba Sea Trips. They are a bit more pricey than other tour companies but boy was it worth spending those extra few bucks! As it’s the furthest me and Alex have ever gone from England we were happy to pay a little extra for the peace of mind of knowing we were in great hands. For the two of us we paid 8,800THB but we only paid a deposit of 4,000THB. The remaining amount can be either paid by cash or card when you get to their office or you can e-mail them for a PayPal invoice, which is what we did. The trip includes pick up and drop off at your hotel (If you’re not staying in the Kata, Patong or Karon area it is an extra 1,000THB for a return transfer), breakfast, lunch and there were snacks and plenty of soft drinks/ water onboard the boat. The maximum tour party for this trip, and I believe it is the same for all of their other trips, is 16 people. Most tours we saw that day had at least double that amount of people in boats that were the same sized or even smaller than ours. Our pick up time was 4:55am. After everybody was picked up we went to the Royal Phuket Marina where there was tea, coffee and plenty of snacks outside. This is where you pay off the rest of the balance for the trip, if you haven't already paid it off. 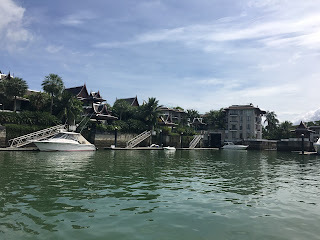 The Royal Phuket Marina was an amazing sight in itself. It's filled with luxurious Asian design inspired apartments and penthouses and expensive yachts, a lifestyle I wouldn't mind living. I'd strongly suggest you look up some images yourself as mine, which I'll insert below, nowhere near does it justice. It truly is stunning!! After everybody had arrived and we had our tea and coffee etc, we met our tour guide, M. He was absolutely brilliant! 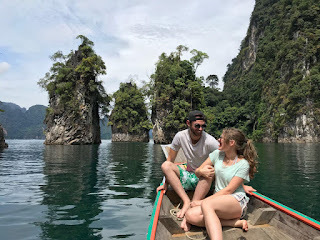 We actually had the pleasure of having him as our tour guide for the Simba Jungle Trip, to Khao Sok National Park which we did a few days after this one (Separate review coming soon). 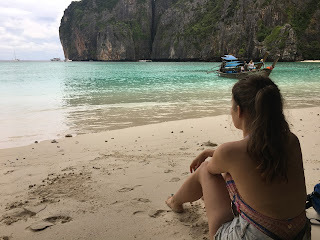 It took us about an hour on the boat to get to our first stop: Maya Bay. 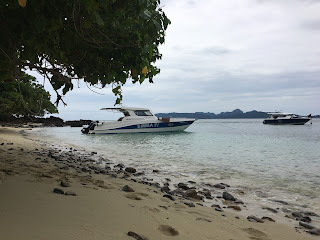 I feel like I should mention one thing before I get onto the actual ins and outs of the tour and that is the extremely bumpy boat journey (If motion sickness doesn’t affect you at all then you can skip to the next paragraph). Obviously, it depends on what the sea conditions are like on the day of your tour and what time in the year you go. 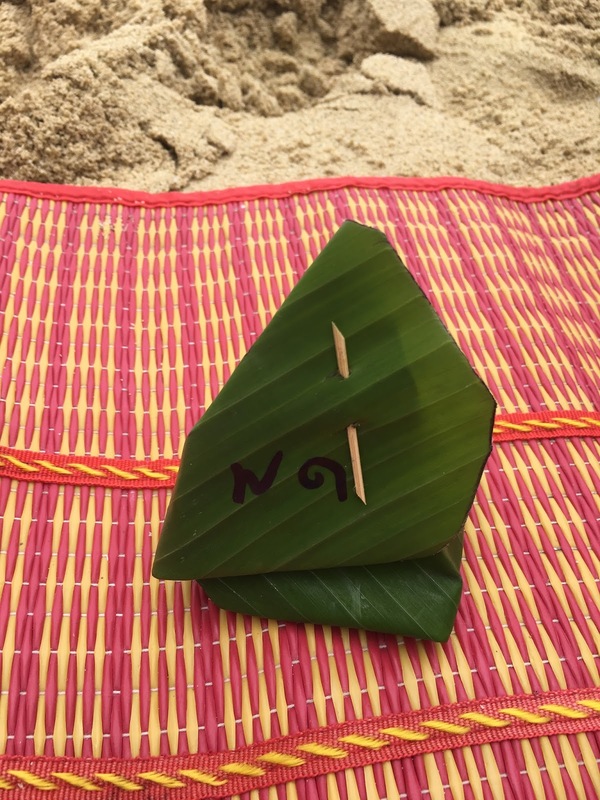 We went right at the start of November, which technically counts as the start of the dry season but it’s the cross over from the rainy season into the dry season so the sea was a lot rougher than it probably would be in January or February: the peak of the dry season. We were flung left, right and centre and if I didn’t start the journey suffering with sea sickness, I sure did by the end of the boat journey. However, this is something that will be the same on every tour and not just something that was down to Simba Sea Trips. 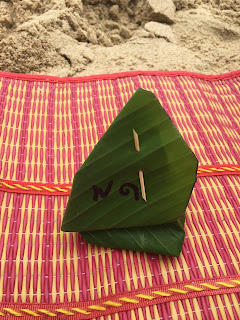 So, invest in some good sea sickness tablets, which they did actually have out on the table when we were having tea and coffee, or maybe think about going further into the dry season when it’s more likely to be a pleasant ride. 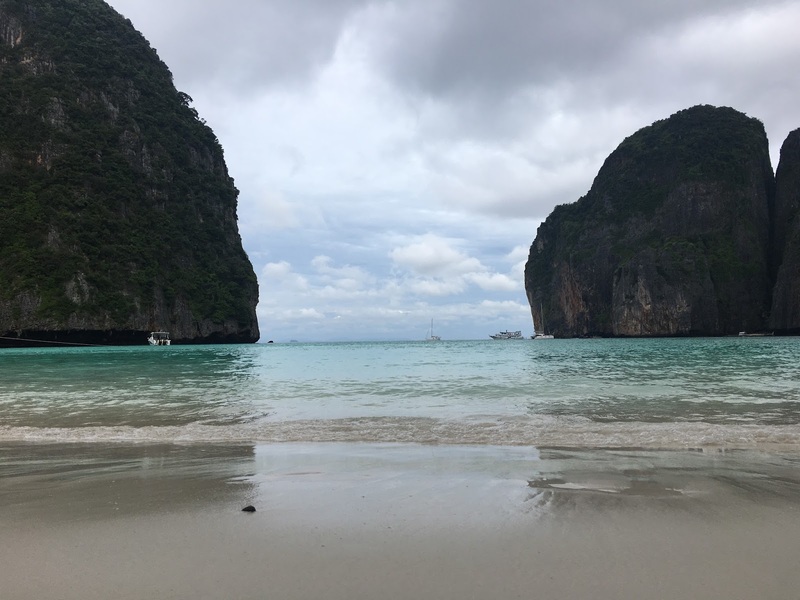 The first stop was Maya Bay and my oh my was it stunning! No picture or video will ever do it justice than seeing it with your own eyes, wow! The water is the most beautiful, sparkling, shade of turquoise and the sand is whiter than you could have ever dreamed. We spent the first twenty minutes or so taking pictures and just admiring the view. The tour guides, especially M, made sure that every couple/ group had way more than enough pictures: he was the same throughout this trip and the Khao Sok one. Once the photography session was over (laughing face), he went to set up breakfast and we went further into the island to explore. 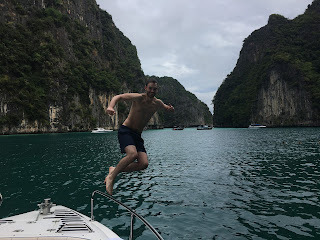 The coolest part of Maya Bay, for me anyway, was when we did this as you feel like you're in the middle of the jungle: It was pretty epic. Through the palm trees and past the playing kittens (who were adorable by the way), there was a viewpoint; The wooden platform for it is quite small and eventhough there wasn't even that many people there, it was quite cosy. When we got back to the rest of the group, we sat down for another 10/15 minutes and had a quick something to eat while admiring one of the most amazing views that you will probably ever see in your life. Then, as the boat loads of people came flooding in, we were off to our next stop. This time there was nobody here so we had the entire Lagoon to ourselves. Well, we couldn't stray too far from the boat because of health and safety reasons but, yeah, we still had it all to ourselves. 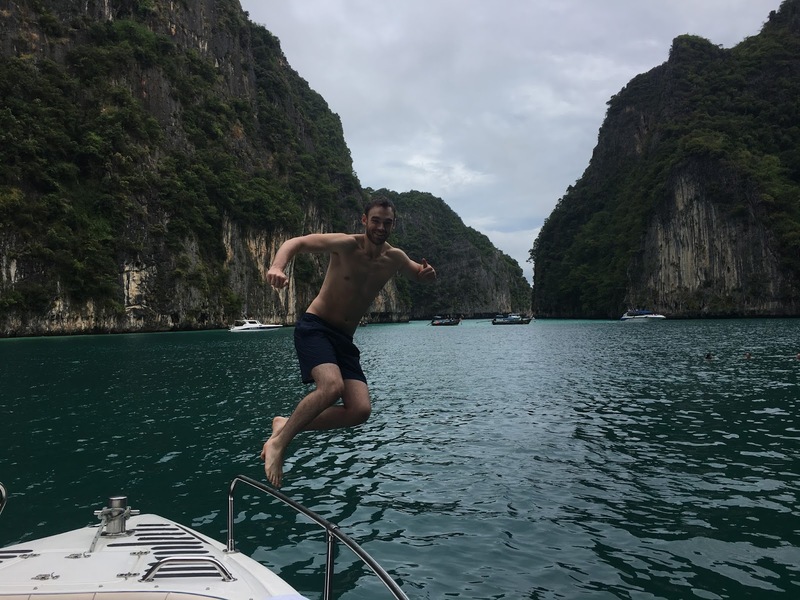 For the more adventurous ones out there, you can jump off from the front of the boat. That being said, if you don't want to go in that way, I almost didn't, then you can just climb into the sea from the back of the boat. Warning for those jumping off from the front of the boat: The level of salt in the sea here is super high so make sure to not accidentally breath in some of the water as you go under, like the plonker I am did. We spent roughly 40 minutes here. They also have life vests and noodle float things (I'm not sure what they're actually called), if you would like to use them. Me and Alex used to the noodle floats because we were feeling lazy and just wanted the float and admire the views. Pileh Lagoon is so so so so beautiful and the water is so clear. It was one of the most surreal moments from our entire trip! Absolutely incredible! Again, no picture or video will ever compare to seeing it with your own eyes. This was the part that I was nervous about. I tried snorkelling earlier on in the year when we went to Greece and let's just say that it didn't go well, at all! It ended up with me in tears, on the verge of a panic attack. 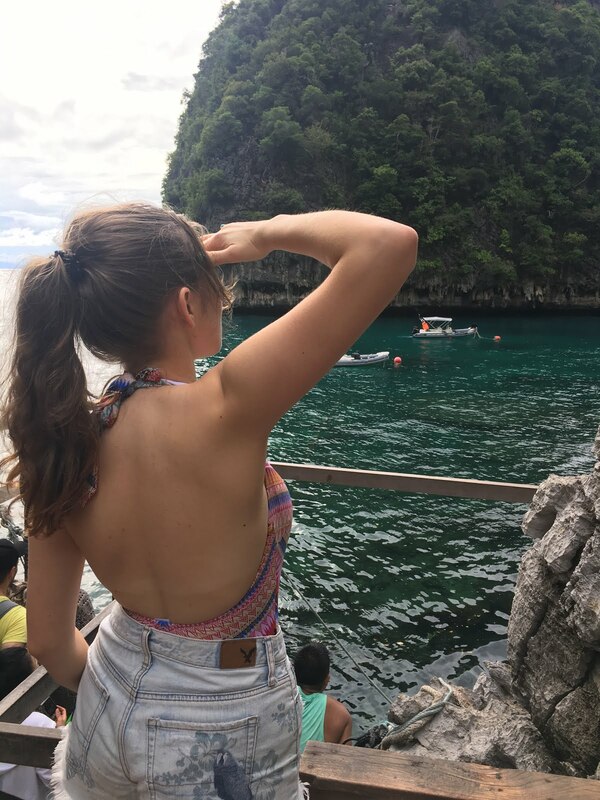 So, I made sure I wore a life jacket so all I had to focus on was the actual snorkelling part (even Alex still took one of those noodle things). It took me about 5/10 minutes of panicking to get used to it before I completely fell in love. I think the biggest problem for me was breathing out of my mouth as I usually breathe through my nose. I also think it just takes some time getting used to being able to breath and see under water because, at first, it feels a little bit odd. We snorkelled in two places, the first was right by Phi Phi Don and the second place was at Shark Point. We saw nemos (Clownfish), a gill (Moorish Idol) and a something that looked like a small sword fish, to name a few. No sharks though. It was an incredible experience that I am beyond excited to do again, whenever that may be (hopefully soon). If you're looking at booking this tour, or if you already have, and you're worried about the snorkelling part my best advice would be; take your time! Whether it takes you 5 minutes, 10 minutes, 15 minutes or even more just go at a pace that feels okay to you. 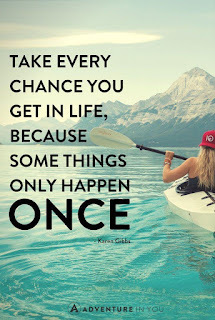 Just keep trying because you will be so glad that you did! I regret giving up in Greece but what can I do about it now? Nothing. 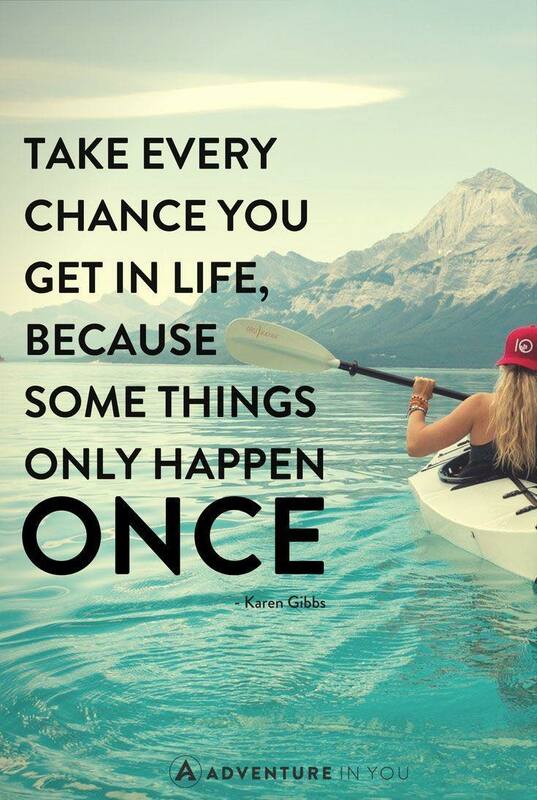 Just leave yourself with no regrets and give it a go! Without a doubt, one of the best experiences of my life! I thought I'd talk about both together as we didn't spend very long at either place. (5 minutes at Viking Cave and 10/15 minutes at monkey beach). Viking Cave was first! I enjoyed seeing it, but as I had watched plenty of Phuket vlogs before coming out I had seen Viking Cave pop up a lot so the awe had kind of warn off. Plus, you can't get too close so you can't see a whole lot but obviously it was cool actually seeing it in person and not on Youtube. It was fascinating learning about it, as that's something you don't often get to see in Vlogs. Did you know that you can buy medicine made from the birds nest in 7eleven? Next was Monkey Beach (or Monkey Rock I should say). It was high tide so the beach had been drowned and the monkeys were stuck chilling on the rocks, which meant that we couldn't get too close to them but to be quite honest, I loved just sitting on the boat laughing and watching the monkeys do what monkeys do! It was just so lovely to see them in the wild doing what they wanted to do when they wanted to do it. When I was first considering this tour I e-mailed the company and asked if we would definitely be going to Bamboo Island, as on their website they didn't specify; it just said that you'd have lunch on a beach. 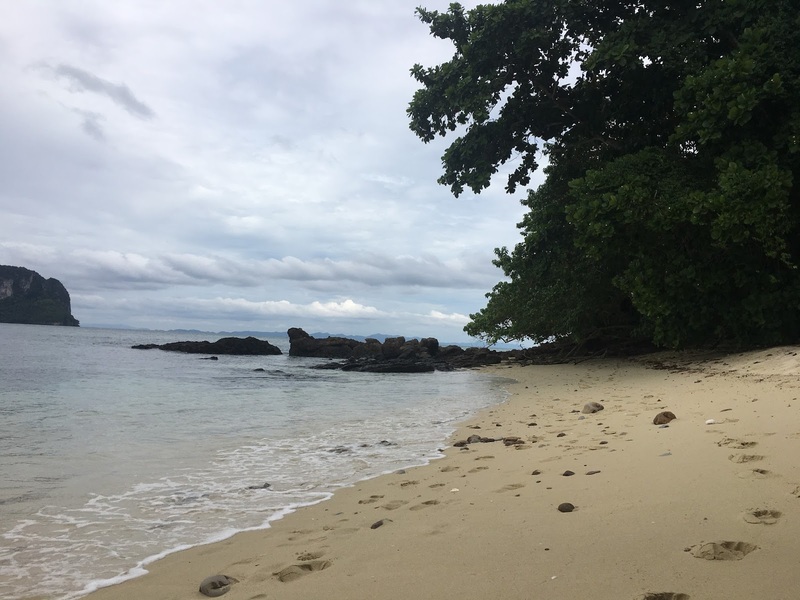 She said that the majority of the time it is Bamboo Island but it depends on the tide and how busy it would be as they're very big on getting away from the crowds. So, when M said that Bamboo Island was on the itinerary, I was quite chuffed. It always looked so beautiful in vlogs and in pictures so I was desperate to see it for myself. Although, it looked different to what I had thought but I think we went to the other side to where people usually went. Maybe it was busy on the other side? Either way, it was still a beautiful island and the part we were on, once again, we had to ourselves The beach was golden and the water was blue and crystal clear, it was stunning! The food was really good too, I'm quite a fussy eater yet there was still plenty for me to eat. After lunch we sat down to relax and admire the stunning view on our beach mat, which is where I fell asleep until Alex woke me up to tell me we were leaving. I know, what a plonker. 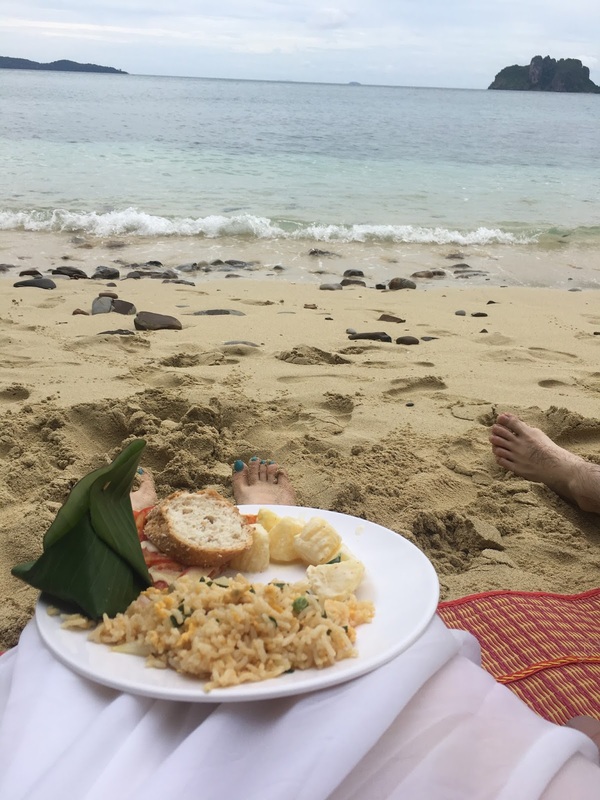 You go to an amazing beach, on a gorgeous island, in the middle of the ocean and you fall asleep. I don't think I realised just how tired I was. I mean, why I thought after travelling for 20ish hours then booking a tour that we had to get up at 4am for the day after (with a 7 hour time difference) was a good idea, I don't know. All I can say is that I've never been happier than waking up to the sound of waves, with the sun shining down and to the amazing view of the ocean. It was one of them perfect moments where you think 'Damn I love life' and you think back to it and you just can't help but smile. 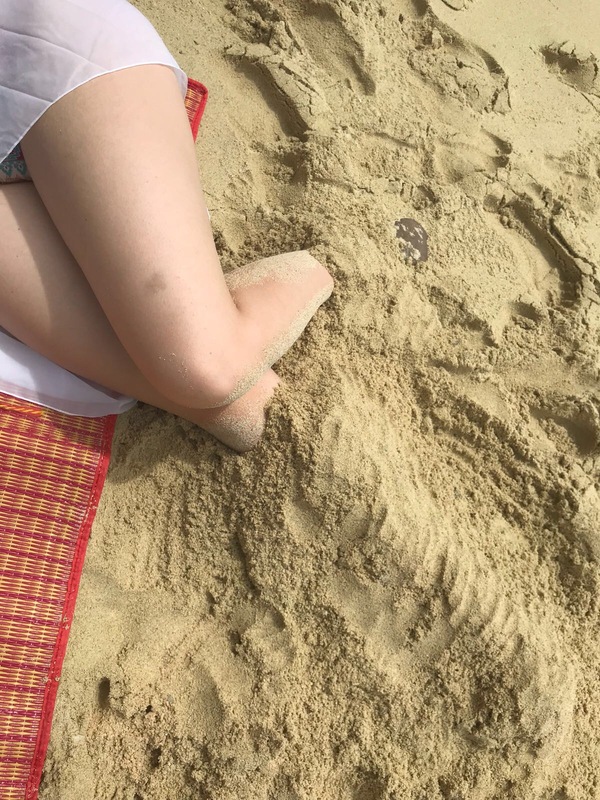 Although I did wake up to my legs being buried in the sand, which meant I then had to spend the entire boat ride back with sandy legs as I didn't have time to wash off all of the sand... thanks Alex! We then headed back to the marina, which was another hour journey on the rough seas. But honestly, I didn't mind! 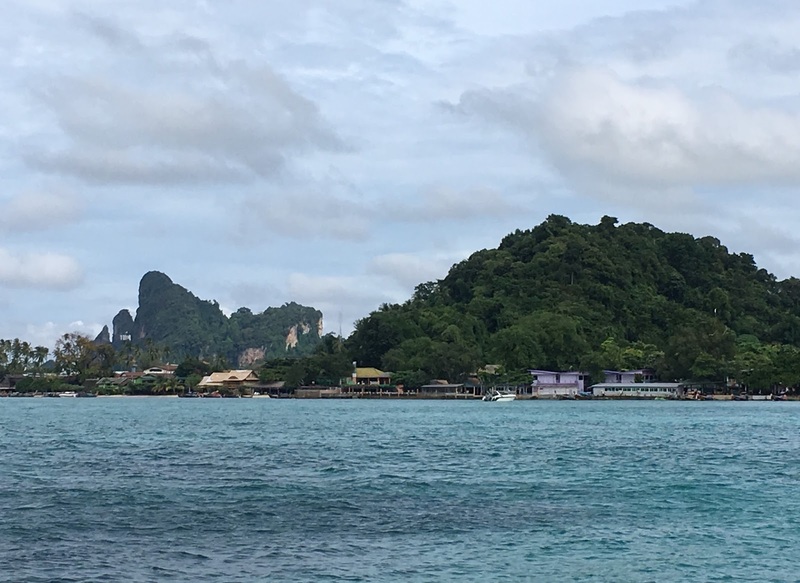 How could I mind being on the sea, going past all these incredible islands on a beautiful day IN THAILAND. All in all, it was a pretty perfect day. One that I know I'll always look back on and just think 'oh my god was I really somewhere that beautiful and incredible'. 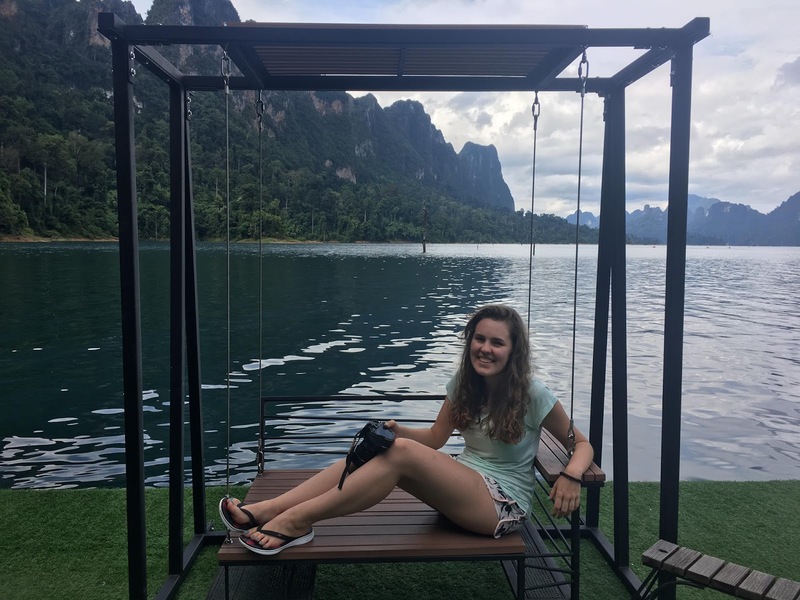 So, if you're thinking of booking this tour or you're thinking of booking a trip to Thailand: DO IT! Simba Sea Trips were an incredible company that I couldn't recommend more! 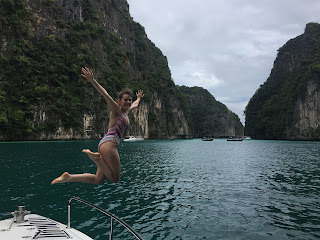 If I ever went back to Phuket (which hopefully I will) I would book this tour again, definitely! If you still have any questions feel free to leave them in the comments below. Thanks for reading and if you are planning a trip to Phuket, I am extremely jealous and I hope you have the most amazing time! Hi, how are you? I hope you're well! My names Meghan and I'm a bit mad, but all the best people are right? This blog is made up of a hint of fashion, a splash of lifestyle, a sprinkle of photography and a whole lot of travel. You should probably expect to see the odd Disney post too. I'm new to this so bear with me and I hope you stay along for the ride.